Thank you Mr. Chair, and all Trade Negotiating Committee for your time. My name is Dwi Eksan Fauzi, I represent the Federation of Indonesian Worker’s Struggle (FPBI). I am part of the 500 workers from SS Print Company, who are, till this day, demanding justice for violations committed by our employer. The company resorted to unilateral lay off without against the law and denying our rights. The investor has fled back to his country leaving back his obligations to the workers. SS Print Company is a garment company, registered with the Indonesian Investment Coordinating Board, with 100% foreign ownership from South Korea. The shares are owned by Mr. Ko Song Ju and SS. Asia Co. Ltd. This case starts with the company’s plan to relocate the factory to another area. However, before the relocation occurred, and without any information to the workers, the management closed the factory in April 2015. The investor left the country without paying his dues to the workers. Until now, we don’t know where he is. 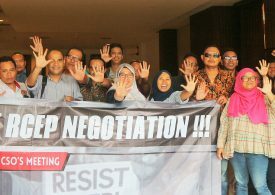 The workers filed a lawsuit to the industrial relations court, and on 25 January 2016, the court ordered SS Print company to give severance pay of IDR 6.6 billion (around 400 thousand Euros) to for 232 workers, in addition to the process wage amount of IDR 2.2 billion (around 140 thousand Euros). The court ruling has permanent legal force. But we were unable to execute the decision because the employer was unknown. We have done all the processes but justice has not been obtained. In Purwakarta, Dada Company suddenly closed their factory in October 2018, after opening a new factory (relocation) with the name of Laspo Company in Boyolali. They closed the factory without giving severance pay to 1,500 workers who had worked for more than 5 years on average. Dada Company is a South Korean garment company that produce international brands. The entry of foreign investments is not directly proportional to the welfare of the people of Indonesia. Investment facilitation and protection have implications that do not favor workers, such as lower wage, labour law dilution, unions bursting, poor working conditions, violence against women workers in the workplace, and so forth. In fact, relocation is often chosen by investors to seek cheaper wages, and this continues to be facilitated by the State by building new industrial zones in areas where wages are low. 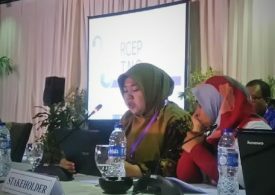 If RCEP includes provisions for further investment protection, it will contribute to aggravate the living conditions of workers in Indonesia. Moreover, the dispute settlement mechanism of investor to state (ISDS) gives privileges to investors rather than workers. 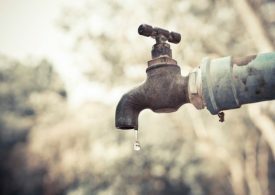 With ISDS, when investors feel disadvantaged by national policies, they can resort to suing the state. How could it be that an agreement contains rules for investor protection but ignores the protection of people’s rights, especially workers? It is very ironic. 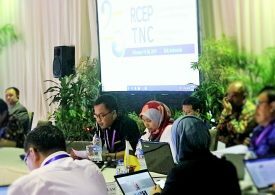 And vice versa, can RCEP guarantee the enforcement of the law against investors who violate the human rights – like in our experience with South Korean investors? Investment protection regulation imposes obligations on the host country, but there are no obligation on the investor, or on the investor’s home country to be responsible for action done by their companies, including the obligation to respect and protect people rights in the host country – such as in our case. 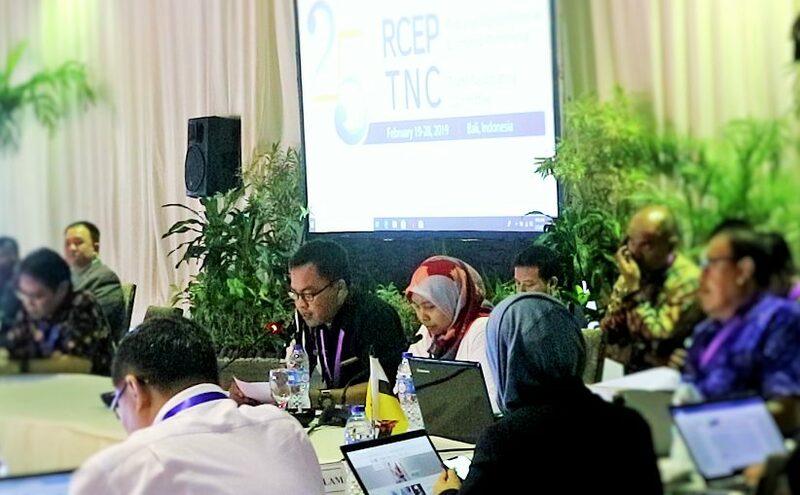 Therefore, we urge RCEP negotiators that investment protection, including the ISDS mechanism, should be removed from the negotiation table. 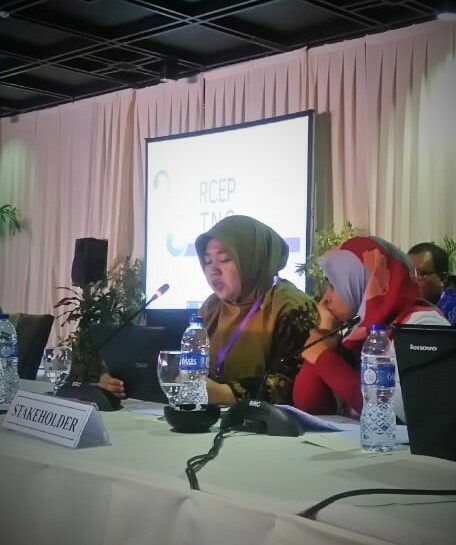 We also ask the government of countries exporting investment, especially South Korean, before you urge RCEP to ensure maximum protection for investors, you must reflect on the behavior of investors who commit human rights violations in Indonesia, or other developing countries. There needs to be a mechanism for cross-broader enforcement of laws against investors in order to ensure the respect, fulfillment, and protection of human rights, especially labor rights.